Made in USA. These sturdy, re-usable plant saucers will help protect your hardwood floors, carpets, decks, and furniture from those harmful water stains and rings plants often leave. It is an economical choice for use with plastic and fabric grow bags. CW plastic saucers provide critical airflow needed for healthy root system to keep your plants healthy. These round clear plastic saucers easily catch excess watering and soil spillage preventing surface stains and protecting carpets, floors, and furniture. 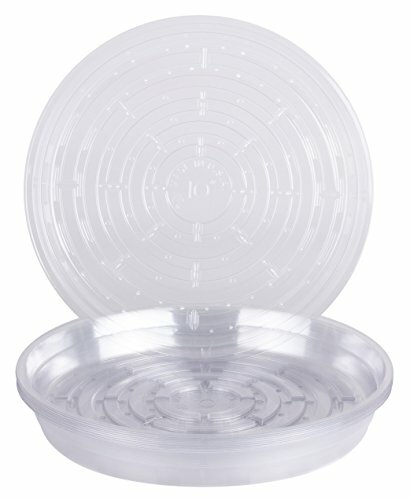 The durable clear saucers mixes and matches with all ceramic, clay, plastic planters and grow bags on the market today. Each saucer has an airflow design underneath that does not trap moisture or dirt for protecting your furniture and floors. PROTECT FURNITURE AND FLOORS - Smart airflow design does not trap moisture or dirt. FLEXIBLE - Lightweight and durable for multiple uses with any indoor or outdoor planter. GOOD FOR PLANTS - Provides critical airflow needed for healthy root system. MADE IN THE U.S.A. - Product made in the United States.